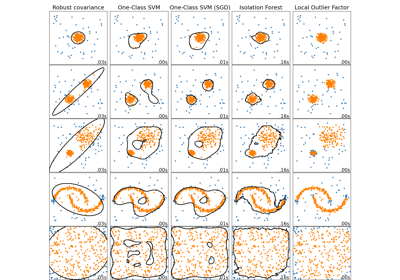 The IsolationForest ‘isolates’ observations by randomly selecting a feature and then randomly selecting a split value between the maximum and minimum values of the selected feature. Since recursive partitioning can be represented by a tree structure, the number of splittings required to isolate a sample is equivalent to the path length from the root node to the terminating node. This path length, averaged over a forest of such random trees, is a measure of normality and our decision function. Random partitioning produces noticeably shorter paths for anomalies. Hence, when a forest of random trees collectively produce shorter path lengths for particular samples, they are highly likely to be anomalies. The number of base estimators in the ensemble. The number of samples to draw from X to train each base estimator. If int, then draw max_samples samples. If float, then draw max_samples * X.shape samples. If “auto”, then max_samples=min(256, n_samples). If max_samples is larger than the number of samples provided, all samples will be used for all trees (no sampling). The amount of contamination of the data set, i.e. the proportion of outliers in the data set. Used when fitting to define the threshold on the decision function. If ‘auto’, the decision function threshold is determined as in the original paper. Changed in version 0.20: The default value of contamination will change from 0.1 in 0.20 to 'auto' in 0.22. The number of features to draw from X to train each base estimator. If int, then draw max_features features. If float, then draw max_features * X.shape features. 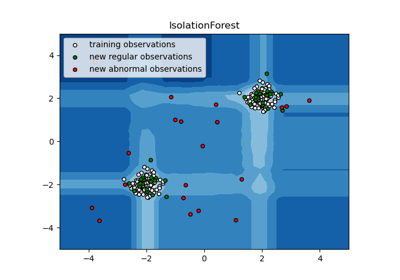 If True, individual trees are fit on random subsets of the training data sampled with replacement. If False, sampling without replacement is performed. Behaviour of the decision_function which can be either ‘old’ or ‘new’. Passing behaviour='new' makes the decision_function change to match other anomaly detection algorithm API which will be the default behaviour in the future. As explained in details in the offset_ attribute documentation, the decision_function becomes dependent on the contamination parameter, in such a way that 0 becomes its natural threshold to detect outliers. New in version 0.20: behaviour is added in 0.20 for back-compatibility purpose. Deprecated since version 0.20: behaviour='old' is deprecated in 0.20 and will not be possible in 0.22. Deprecated since version 0.22: behaviour parameter will be deprecated in 0.22 and removed in 0.24. Controls the verbosity of the tree building process. The subset of drawn samples for each base estimator. Offset used to define the decision function from the raw scores. We have the relation: decision_function = score_samples - offset_. Assuming behaviour == ‘new’, offset_ is defined as follows. When the contamination parameter is set to “auto”, the offset is equal to -0.5 as the scores of inliers are close to 0 and the scores of outliers are close to -1. When a contamination parameter different than “auto” is provided, the offset is defined in such a way we obtain the expected number of outliers (samples with decision function < 0) in training. Assuming the behaviour parameter is set to ‘old’, we always have offset_ = -0.5, making the decision function independent from the contamination parameter. The implementation is based on an ensemble of ExtraTreeRegressor. The maximum depth of each tree is set to ceil(log_2(n)) where \(n\) is the number of samples used to build the tree (see (Liu et al., 2008) for more details). [Rd7ae0a2ae688-1] Liu, Fei Tony, Ting, Kai Ming and Zhou, Zhi-Hua. “Isolation forest.” Data Mining, 2008. ICDM‘08. Eighth IEEE International Conference on. [Rd7ae0a2ae688-2] Liu, Fei Tony, Ting, Kai Ming and Zhou, Zhi-Hua. “Isolation-based anomaly detection.” ACM Transactions on Knowledge Discovery from Data (TKDD) 6.1 (2012): 3.
decision_function(self, X) Average anomaly score of X of the base classifiers. fit(self, X[, y, sample_weight]) Fit estimator. fit_predict(self, X[, y]) Performs fit on X and returns labels for X.
predict(self, X) Predict if a particular sample is an outlier or not. score_samples(self, X) Opposite of the anomaly score defined in the original paper. Average anomaly score of X of the base classifiers. The anomaly score of an input sample is computed as the mean anomaly score of the trees in the forest. The measure of normality of an observation given a tree is the depth of the leaf containing this observation, which is equivalent to the number of splittings required to isolate this point. In case of several observations n_left in the leaf, the average path length of a n_left samples isolation tree is added. The anomaly score of the input samples. The lower, the more abnormal. Negative scores represent outliers, positive scores represent inliers. Returns a dynamically generated list of indices identifying the samples used for fitting each member of the ensemble, i.e., the in-bag samples. Note: the list is re-created at each call to the property in order to reduce the object memory footprint by not storing the sampling data. Thus fetching the property may be slower than expected. Sample weights. If None, then samples are equally weighted. not used, present for API consistency by convention. Performs fit on X and returns labels for X. Returns -1 for outliers and 1 for inliers. 1 for inliers, -1 for outliers. Predict if a particular sample is an outlier or not. For each observation, tells whether or not (+1 or -1) it should be considered as an inlier according to the fitted model. Opposite of the anomaly score defined in the original paper. The anomaly score of the input samples. The lower, the more abnormal.